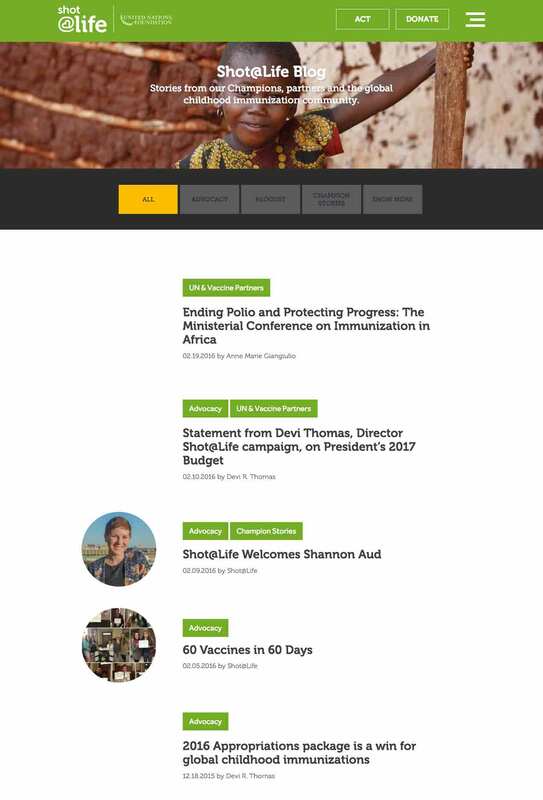 Our work with the United Nations Foundation began with a full site rebuild of their Shot@Life site in 2015. From there, we worked on various micro sites for the organization, including the annual Blogust vaccine drive and the 12 Days of Impact project. The Girl Up initiative is the latest site under the UN Foundation’s umbrella to require BFC’s attention. Below, we highlight some of the aspects we brought to Shot@Life when constructing their site. There are a number of key forms spread throughout the site, all using the WordPress plugin Gravity Forms in association with Shot@Life’s Convio account. Prominent among them is an application to become a Shot@Life Champion – individuals who dedicate their time to advocate for childhood around the world. 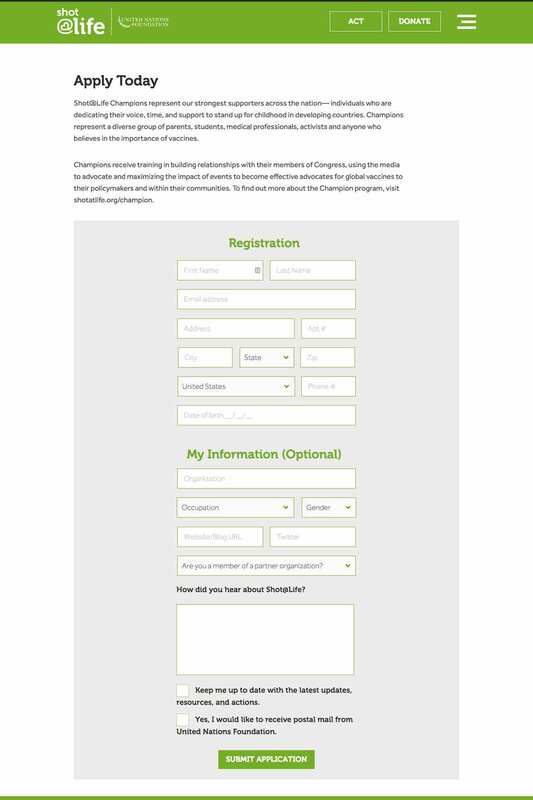 The simple design makes the application process easy, and allows Shot@Life to keep interested visitors informed of the organization’s actions. Custom fields neatly appear when certain options are selected, and the entire form scales down to the smallest mobile screen. The Shot@Life blog is packed full of functionality. Tabbed browsing allows visitors to sort the posts by category, with further categories becoming available on hitting a custom “load more” button. Visitors can view the most recent seven posts in each category, with a custom built Ajax button allowing further “load more” functionality should more posts be required. Its all a seamless process that aligns perfectly to mobile devices, and adds further layers when the category section is clicked on within the posts.